My boating adventure began a few weeks ago. It is amazing what you can learn if you ask and listen, so I am continuing the journey. Some of the story. My wife is from a large family. The patriarch of the family passed away last year. As things were being gone through and memories shared this year, the subject of dad's old boat came up. The 1962 MFG Edinboro had been put into a garage and had not seen the sun since the 1979 license plate sticker was still good. Enter my sense of family and sentimental moments. The family farms, so no time to put into a boat. I run my own business so, I have time to be distracted into various projects. The list is long. The extended family usually gathers around the 4th of July. Very proud Americans, and very grateful to those who let us all enjoy this great country. Anyway...................I first had to shovel raccoon poop and whatnot out of the boat. Messy, but not bad. enter the power washer, elbow grease ( I have lots of nieces and nephews). The excitement started as the buzz started for "fixing grampa's boat". The engine was frozen solid. I tired all the internet stuff to try and break it free. I even tried the folklore recipes from folks all around the harbor. Nothing. Went to sledge hammer and hickory on the pistons, nothing. Even welded together a nice high torque hook wrench to put some motivation on the flywheel. Nothing. I found a guy who was awesome and he had a yard full of motors, so we swapped some parts and he set me up with a working motor. He laughed like crazy at me thinking I was going to get a 55 year old two stroke turning after it had been still for 38 years. OK, so I checked the fiberglass, made sure no cracks, etc....rigged it all up. My dream team helpers got the paperwork all up to date. We launched the boat. Even that was an adventure as the lake levels are historically very high and getting the truck into the ramp without flooding the floorboards took just the right touch. I have awesome brother-in-laws that can do about anything. So on its maiden voyage (the ramp is about 4 miles across a by from the dock where it is kept) it ran great. Over the weekend of the fourth we had kids and in-laws and friends having a great time. One of my brother-in-laws knows what he is doing with boats and he showed me how to make sure we were safe. It was a blast. Something about a boat, a tube, family and a lake on the 4th of July. Anyway, she burned about 3 gph. And it goes pretty good. even my son (adult 20 something) would appreciate WOT on the thing. OK, so what is my question now after all that. So fast forward to this past Sunday. It had rained and the boat had six inches of water in the back (stern ?). As I baled, it did not look right. I found a crack on the inner wall of the transom, then looked behind it and saw the outer shell of the transom was cracked and the bottom motor mounts were digging into the transom. Called a buddy, he said get it out of the water. I figured I'd get into the middle of the bay and the motor would drop off, it was choppy. Very interesting ride. Got it out and to the yard. Hoisted the motor off and got out the grinder. Opened up the transom. I had good potting soil in between the inner and outer fiberglass. It's all dug out and I am figuring on Sea Cast. I get that its a $500 deal, but the pour looks pretty straight forward. I have found two competing products. Now understand that I am a guy that starts with John Deere and Ford and anything else is looked upon with sceptisim, but I also realize that there are many other great products out there that might save me money and still do the job, but how can you tell ? I also realize that John Deere and Ford have had to reduce their once bullet proof design and manufacturing, so I also dont like to pay just for a historical name brand versus get the right value for the product. Anyway. Is there a better product than Sea Cast taking into consideration the high dollars I will be paying for the Sea Cast ? I really do not want to do the wood and poly thing, so a pouring compound is where I am headed unless you guys tell me different. I want grampa's boat to last well into when I am a grampa (hopefully a while yet). Second question: I have read that 1962 Edinboro's have fiberglass stringers. Not wood encased in fiberglass, but fiberglass carrying the load. Is this true ? If so, I am right to assume that there is nothing I have to worry about under the floor. The floor is in great shape and it sounds like a tank when I hit it with a hammer listening for soft spots. It also sounded great hitting waves at 30 mph when we ran it. Third question: I have read that the foam could become waterlogged. The spec on the boat says it weighed 720 lbs in 1962 out of the factory. I am going to weight the boat. I am figuring if it is less than 800 lbs it is not water logged and I am just going to do the transom and not cut open the floor. I have a 1962 Edinboro and you are right on in your thinking. Seacast is OK - my brother used it to do a self repair on our family's old 1965 Edinboro and it has held up. For mine, I chose to use CarbonCore CarbonBond. It's a little cheaper and now available in 1 gallon sizes, and also I think it's a little easier to do a pour and avoid voids, since it is not as thick as Seacast. 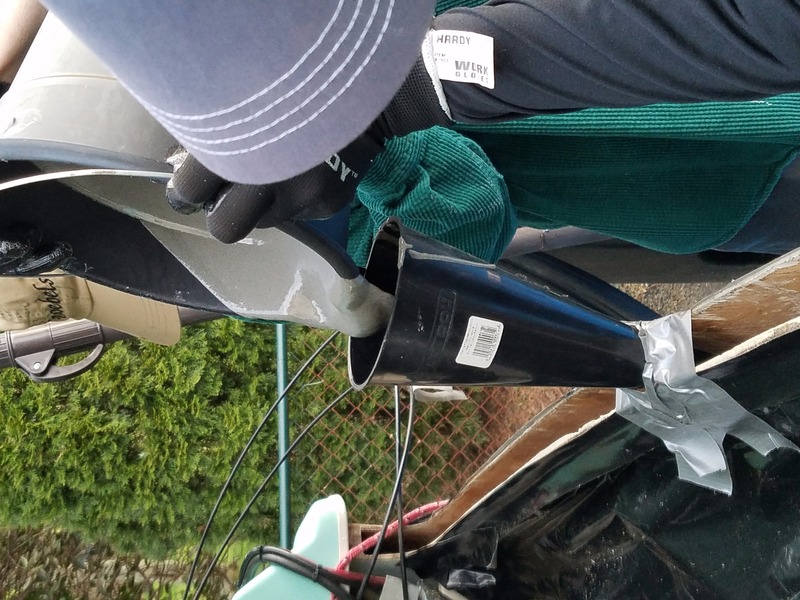 However, I had my transom professionally done by a restoration shop, as my transom had a lot of cracked fiberglass damage, as did the motor well, all from the transom wood that had turned into peat moss. Given all the extensive repairs needed, and not wanting to use paint, but rather re-gelcoat the repaired areas, my choice to have a pro do it was an easy decision. More expensive, yes, but for me, worth it. 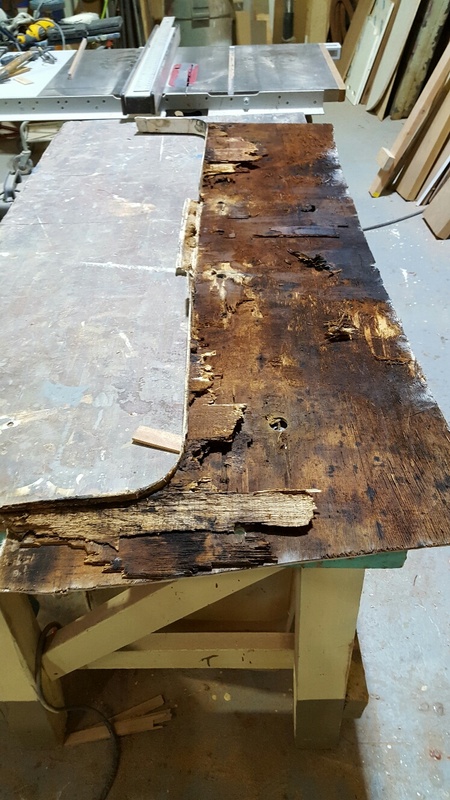 Also, to make sure to have proper bonds, I decided to have the restorer remove the inner skin, leaving a tab, to make removing all the wood easier to complete and also making the fiberglass repairs on both sides of the skin for better strength much, much easier. 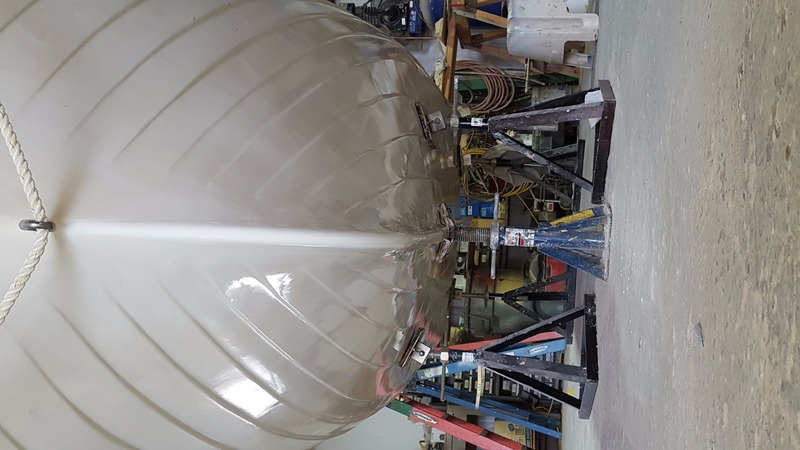 They used a certain deck rib from a larger old Lyman that matched the radius of the curved MFG transom as a form to get the exact curve back in the repaired transom. 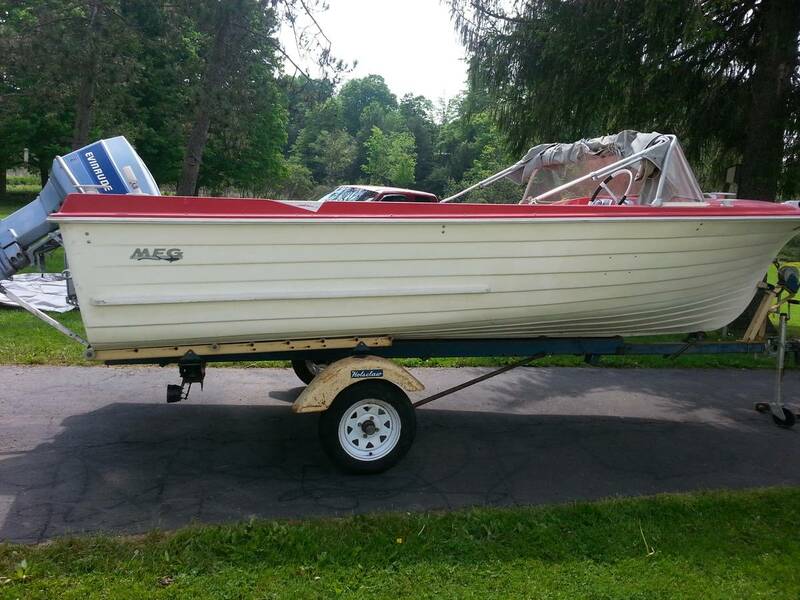 Since my boat is one of the very few red deck models still around, and the only one I have ever found for sale with the original Sun 'n Fun seats still with the boat and in pretty good shape, I decided to pay to have the transom, keel and motor well done, while doing the rest myself. 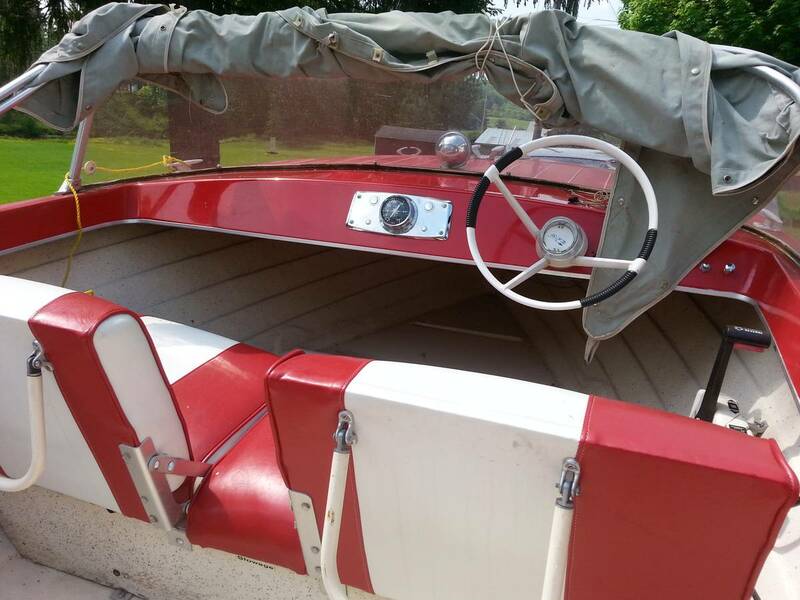 (I have found one other 1962 Edinboro with a red deck and red and white seats like mine that is on a You Tube video.) My boat still a work in progress, but getting there. Mine now weights 865 pounds after those repairs. These boats do have fiberglass stringers, which is one reason why I stick with MFGs of this era. (I also have a 1966 Niagara.) CarbonBond added about 40 pounds to the weight, so I figure my un-repaired weight was about 825 pounds, gotten by weighing the boat on the trailer, then weighting just the trailer, all with the motor off the boat. I think the spec weight is low, as it stayed that weight in the brochures for a long time, then in the late 60's jumped to 934 pounds. The later models had more equipment, including a built-in gas tank. So I figure 825 pounds is OK, as that includes the wiring harness and the control for the motor in that figure. and thus probably weighs no more than about about 35 pounds more than the real original weight. All acceptable to me. I think there is some moisture in the foam under the floor, but 35 pounds is not bad, so I'm not going to go to all the extra trouble and expense to tear out the bonded fiberglass floor. Water normally gets under the floor if the boat sits out in the weather. The seats are fastened with anodized aluminum brackets that screw into the floor using well nuts. The black rubber deteriorates and lets water in. Interestingly, only every other channel under the floor is foam-filled. Try taking out the floor plug on the outside on the transom (to the right of the bilge plug, as facing the transom), raise the tongue of the trailer up to the stern is low, and see if any water drains out. Water can also get in if there are cracks in the floor (mine has some minor ones) or if there are any holes in the floor - mine had one drilled in the little bilge well at the drain plug area inside the boat. Go figure. What motor are you now running with, year, make and hp? I would love to talk to you directly. I'm really into MFG boats, and am a member of the Antique and Classic Boat Society (ACBS - the major all-marque old boat club in the world) and also the Antique Outboard Club (AOMCI). Do you have any pictures? I have tons for mine, here are a few. I ordered up the Sea Cast. Outstanding technical support ! Worth every penny. The support called me as I inquired about the order and took me through all the details that i would have missed. Excellent ! I should be doing the work next week when the materials arrive. There are some photos attached. Seacast is a good choice, too. Let us all know how it comes out. Your transom fiberglass is in much better shape than mine was. While it's all repaired now, it was a lot of work. 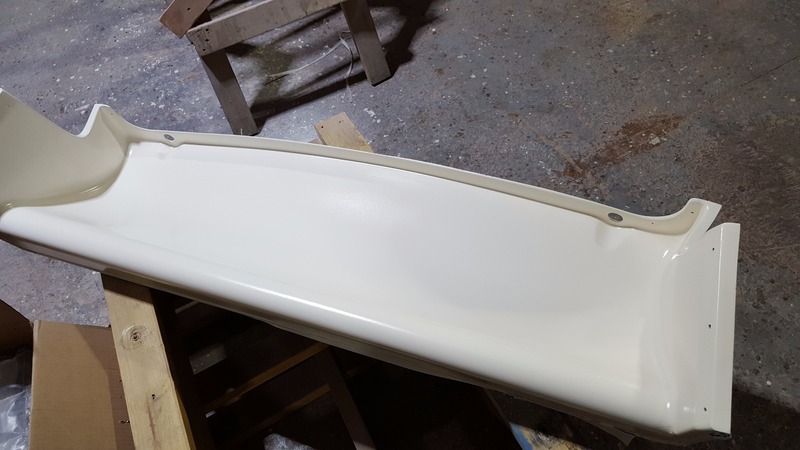 Does your boat have the wood spray rails painted white on each side of the hull? In 1963, they went with a rails made the same way as the rub rail. BTW, what are you doing with your seats.? I see from the picture you have at least one seat left. I have one broken bracket on one side of one seat (the part that hinges the seat and seat back together) If you are scrapping the seats, I'd love to buy the brackets/hinges from you. Also any L-brackets still in good shape that hold the seat's bottoms to the well-nuts in the floor. Thanks and good luck on the repairs. I'm sure it will be great when completed! 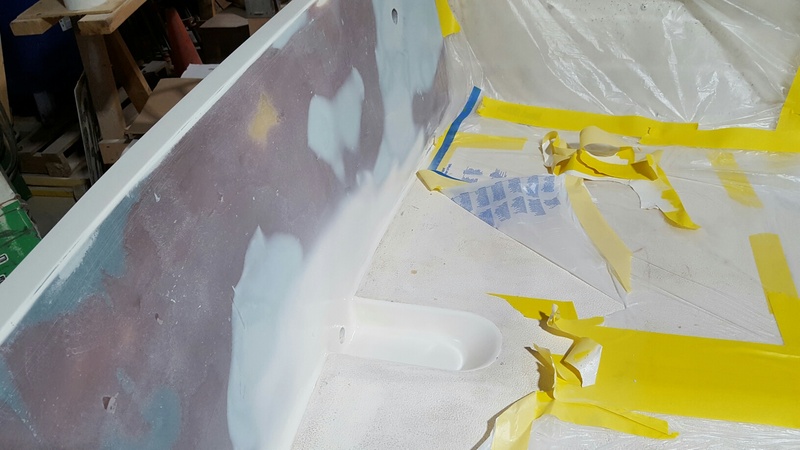 Check out entry in this forum titled "transom repair". I recently used Cabon-Corethanks to a tip from Dave. The product was very easy to use. Pours like molasses. No need to force product into corners and starts to harden like cement in 20 minutes. Lightweight and alledgedly floats. 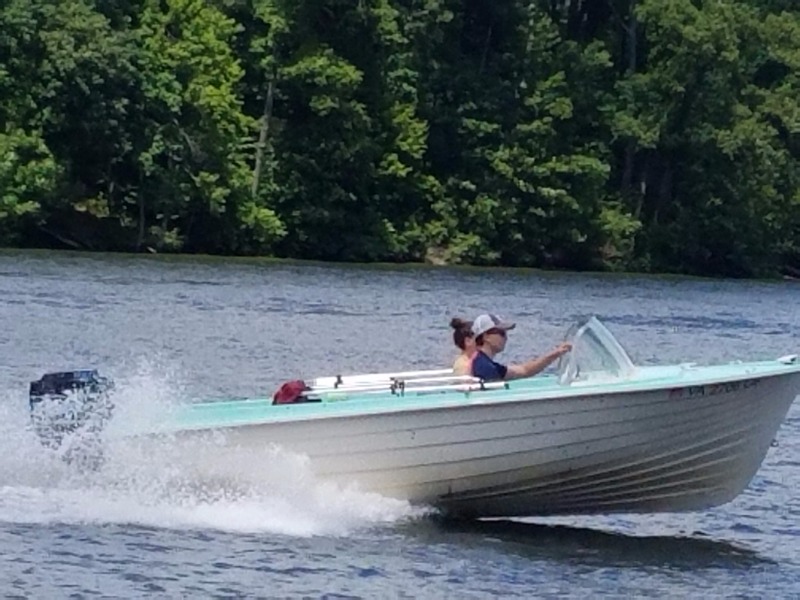 I have a heavy 85 HP Merc on my 64 Westfield.Just got off the the lake pulling my kids on tube. Boat catches air, slams down and is holding up great. Good luckâ. Good to hear another old MFG has a repaired transom. Yes, CarbonBond is a little easier to work with and hardens into a rock. It's a resin/ceramic composite material. Seacast works too, just different composition of resin and fiberglass. I'm well familiar the Westfield. Growing up, my family had two of them, along with a little Corry Carefree, plus an Edinboro. My brother still has the Edinboro. 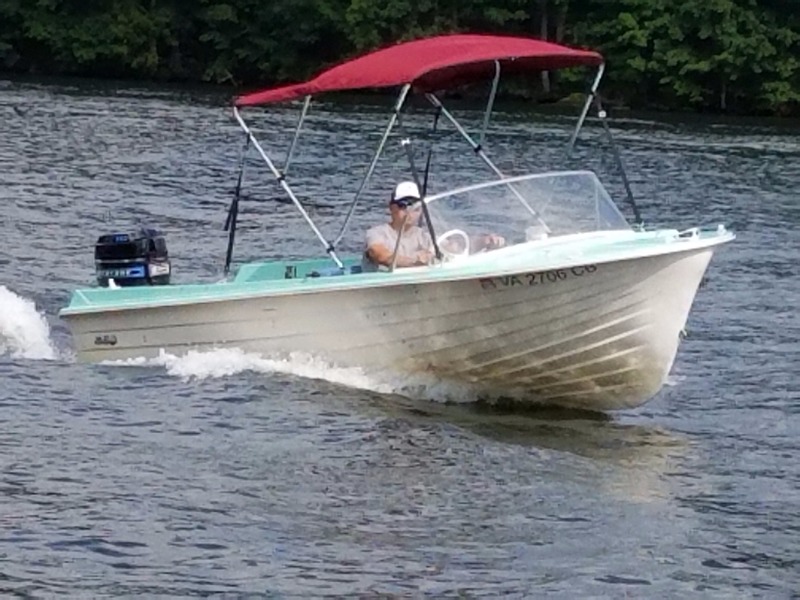 The Westfield is a good solid boat, like the others, and a nice size - sold as a nominal 16 footer. My Niagara is sometimes too small, and the Edinboro is absolutely the biggest boat I can fit in the garage and pull with my Honda CR-V.
My brother offered me the Edinboro once, but I turned him down. 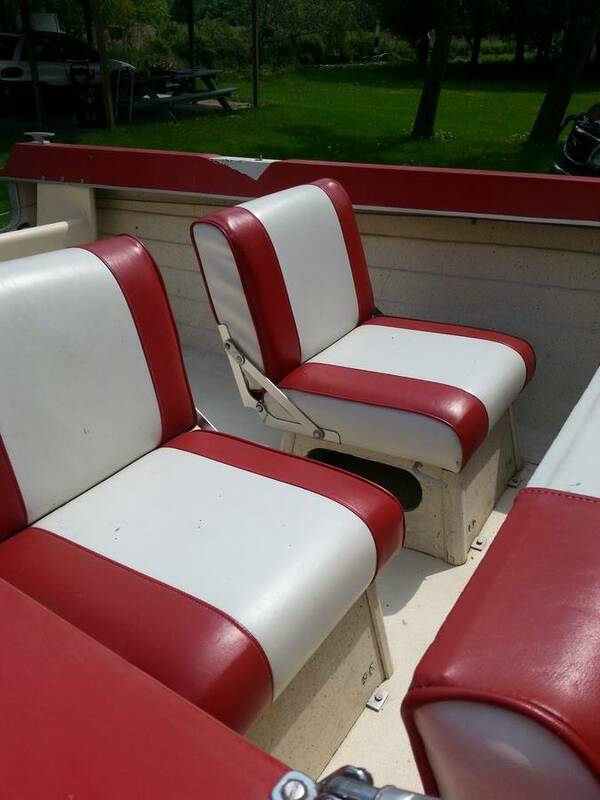 The boat had hit a dock and needed major deck repairs, and the seats were pretty worn out. Also green - not my favorite color. I'm partial to the blues and reds. But that's just me. 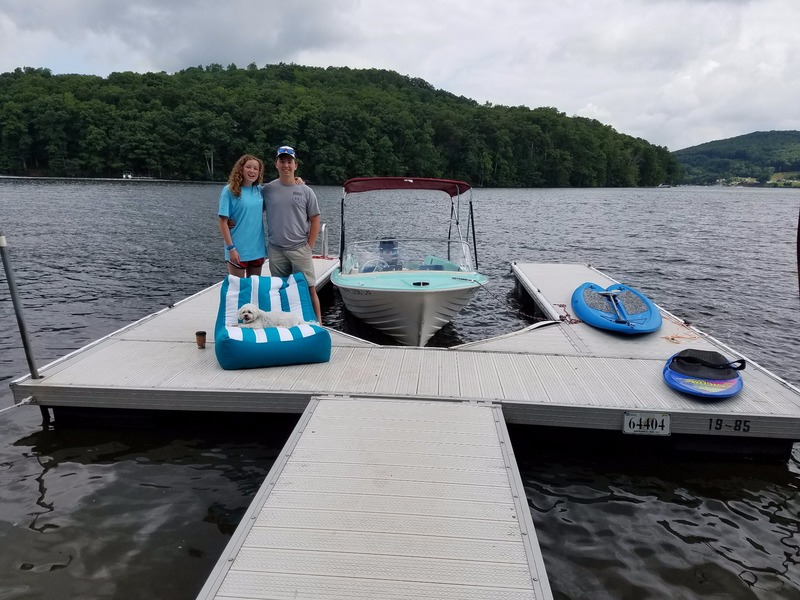 Enjoy the boat and the rest of the summer! Thanks again Dave for your tip on Carbon-Core Product. Just spent an awesome week with family at Deep Creek Lake House in Maryland. Dream vacation with Westfield parked at dock of house. Everyday we went skiing, tubing and fishing on the boat. Beat the heck out Westfield doing high speed turns and launching my kids from their tube. I'm jealous that you had MFG's growing up. For me it was just a dream to have a lake boat. Nice to see all of my family's hard work on boat come to fruition. This site made it possible.